Democratic gubernatorial candidate Matt Brown attacked pension cuts for state employees dating back to Governor Raimondo’s previous role as state treasurer at a town-hall style “Restore Our Pensions” event at the WaterFire Arts Center in Providence on Monday evening. The event came mere hours after WPRI published polling results showing Brown lagging behind in name recognition, and featured vocal ire from one advocate for the governor. 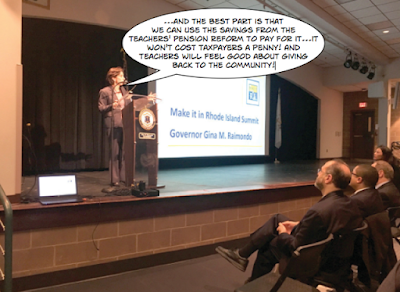 Despite those setbacks, an overwhelming majority of attendees, many of whom were retired teachers, responded to Brown’s proposals and critiques of Governor Raimondo with excitement, and many expressed a sense of betrayal at the governor’s previous management of the pension fund. In 2011, Raimondo announced that the state would freeze cost-of-living adjustments (COLAs) for two decades, as well as invest more than $1 billion in retirement assets in hedge funds for “hybrid,” 401(k)-style retirement plans. Brown pushed further, arguing that “the drastic cuts that Governor Raimondo put in place did not need to be made,” and that the state had lost $500 million in in “high-risk, high-fee” hedge funds, as opposed to what would be made in stable index funds, in the process. Many testified that, without COLA increases, their pension funds were not enough to make ends meet. Maribeth Calabro, president of the Providence Teachers Union, told the room that Raimondo had “changed her future,” vastly extending the time which she will have to work. In the middle of attendees’ testimonies, a man who identified himself as Adam Lupino got up to offer what he qualified as a different sort of account. Brown did not directly touch on the dissenter during his speech, but after the event, I asked him how he would respond. “What we were doing tonight was getting the truth out about pensions,” he said. “That story was told, it was told by [the pension reform advocacy group] Engage Rhode Island with millions of dollars, it was told by Governor Raimondo.” Brown then doubled down on the fact that the cuts were unnecessary and the investments were highly costly for the state. I also pushed Brown on his response to that afternoon’s polling results. According to WPRI, 45 percent of voters “have no opinion” of Brown, and while he nearly matches Raimondo’s favorability among Democrats at 23 percent, and has a higher favorability among independents, Brown still has a ways to go to increase his name recognition before the primary in five weeks. The poll also showed Brown lagging behind Republican gubernatorial candidate Allan Fung, at 21% and 26% respectively, which might mean that Brown might continue to face a tough race should he win the primary. The Raimondo campaign did not respond to a request for comment by the time of publication.